We all know how important planning is to a successful project. Therefore even for small projects it is always good to have a plan. Planner is about as easy as it gets when it comes to planning tools. However still some users cannot read the simple gantt charts produced. We put the Planner Calendars feature in to help address this and it has been proving very popular. You simply select the calendar tab in Planner to see all your tasks showing on the calendar display. You can easily see which day the task starts on and finishes on. Each task will also be coloured in-line with the instructions in the current view, so Milestones are usually black, tasks red etc. 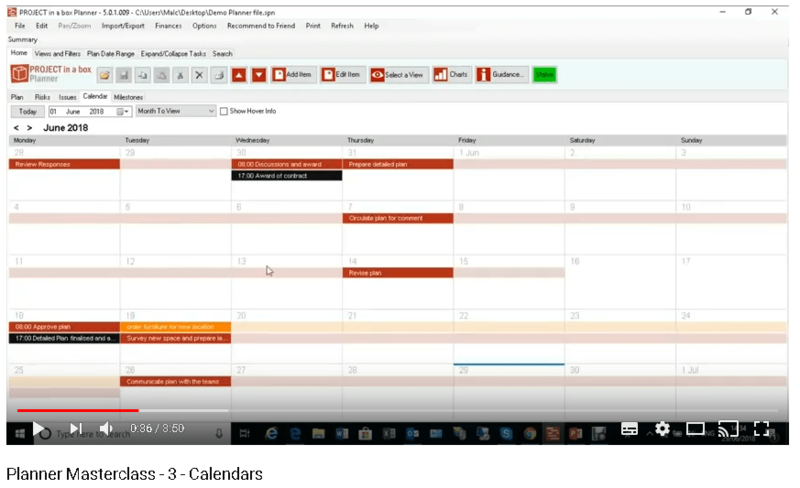 Your Planner calendar display can either monthly and weekly. So if you have lots of tasks on a particular day it makes it easier to see them. You simply click on the task to open and edit or read it. Planner also gives you some information on hover if you want it. When you are working in Planner the calendar display can also show the risk and issue responses from the same Planner file. As well as using the Planner calendars directly in the tool you can also export them as an .ics file. You can then use this .ics file to load the task info into Outlook. You do this by simply dragging the .ics file onto the Outlook Calendar tab. Of course because of the Views in Planner it is possible to create .ics files with different sets of data in them. you can therefore create the tasks for Supplier A, rather than all suppliers. 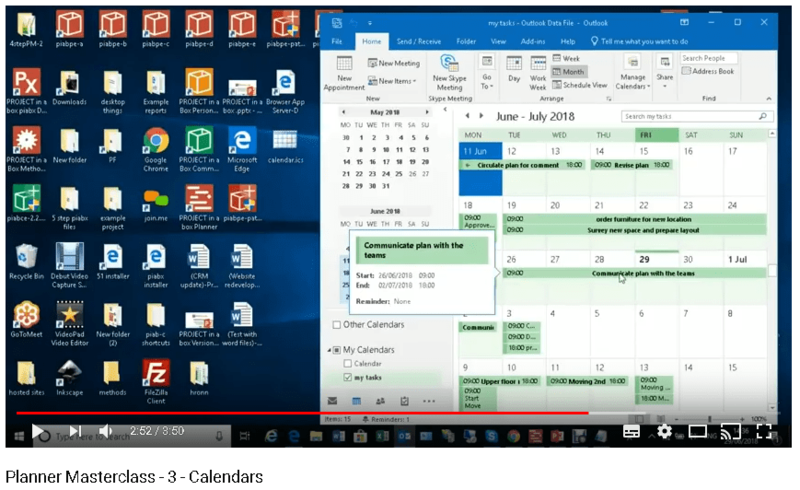 This calendars functionality is unrivalled for many Planning tools and incredible for a free planning tool like Planner. We have prepared a video walk through of this which you can see here in YouTube. Of course you can download Planner from here for free and use it for as long as you wish.